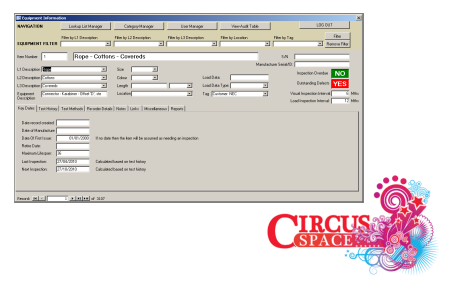 Built to enable a busy Circus Training School to quickly and easily catalogue 1000's of pieces of equipment and location, this comprehensive database development project is helping the organisation meet its vital Health & Safety objectives. The equipment classification and inspection database development provides tracking for equipment, logging of test data and test histories, with reminder prompts when test are due. Plus a full audit trail, via secure log in, for health and safety purposes. Run a variety of vital reports to assist in the smooth running of the business.